4-5-12 The prompt: There are four points of the compass A fifth point is possible in some Asian cultures. I headed north from Chelsea, knowing the destination. All of my fears followed me. Some even led. Funny that it seemed like time slowed. The footsteps got smaller. The noise of the traffic faded a bit. I felt yanked along, with Ma shouting in my ear to “Keep up!” That’s what it’s like with the homecomings. I circled the block, heading east past the mafia restaurant over to Sixth Avenue, then down again, south to 18th, west to Seventh. I had to go in sometime, but remained reluctant. I was tempted to go back and dive down into the subway, but knew there was going to be no easy way out. Maybe just once more around the block. Dragging the hoard with me, I stepped back into my mother’s heart. I have your mug. Am considering ransom terms. When considering ransom, please recall my story contribution of last night. Hmmm… I will accept your awl, handle first, placed gently in my hand. If I remain unharmed, I will tell you where your mug is buried. It has a straw for breathing. For now. I contacted the FBI, not to tell on you, but just to ask for their advice. They said I should act natural, and don’t do anything to anger you. Would you like to come over for a sleepover? Maybe we can have ice cream. I’ll supply the ice cream. Could you bring the mugs to eat it out of? Ask your mom. My mom says don’t mess with my name. She also likes your mug. She wants to know could you bring the ice cream over here. We are contacting you on behalf of our client, Mr. Janoš Svěčim. Mr. Svěčim called us about his concerns that you may be interfering with his progress as a world-renowned author and speaker. His contention is that your possession of his mug has caused him extensive and pervasive emotional harm. When we met with him in our very prestigious office overlooking the financial capital of this great country, he was distraught, beside himself, and weeping. We were barely able to console him. I (this is Jim Fletcher speaking) barely recognized him, as he has not been able to focus on his personal care since the loss of his beloved mug. We would like to resolve this matter (your theft of our client’s mug) in a manner that benefits all. Our offer to you will include a quantity of ice cream to be determined through binding arbitration. You will also be allowed weekly visits with the mug to ensure the health and well-being of said mug. Our preferred time for this visitation would be Thursday evenings, but other times can be negotiated at arbitration. Our client has agreed that these terms seem reasonable, considering the circumstances. We hope that there will be no delays in your response. If you rebuff this offer, we will have no alternative action other than contacting the authorities. In Western Massachusetts, we understand that this often means the involvement of a “Marshall” or “Sheriff and Deputy”. We would regret this course of action, and believe that you would also. We ask only that you act in a reasonable manner and consider the well-being of our client. I’m very sorry – my daughter Amanita has gone comatose upon receiving this communication. The last words she uttered were garbled by a massive spasm of stomach muscles. Did you threaten to give her ice cream? She is massively allergic to ice cream. My attorney will be contacting you in the dark of night. Our office has received a request for aid from the law offices of Galbon, Fetcher, Wheezley, and Forbes, an LLC based in New York City. The request is regarding an alleged abduction or involuntary restraint, and so would normally be forwarded to the US Department of Justice for action by the Federal Bureau of Investigation. We have decided to accept this request for aid until we have received information which would elevate the matter to a Federal level. As such, we would ask you to forward to our office a brief summary of the situation as you believe it to be true. We will take this summary into consideration as part of the preliminary investigation by our office. If you have any supporting documents or evidence, or statements by witnesses, please forward them as well. The Office of the Attorney General of the Commonwealth of Massachusetts is not a mediator in cases such as this, but we would like to provide an environment in which resolution can be achieved prior to court action. Your prompt attention to this manner would be appreciated. Mail Undeliverable at this address. Resident seems to have vaporized, leaving only a mug and a spoon behind. Please inform all parties of this tragic matter. We were very sorry to hear of the vaporization of your comatose daughter, the suspect Amanita Buntburn. This office wishes to offer its deepest sympathy at your loss. With no perpetrator available, we are forced to cease our investigation. Please keep a copy of this letter on your person at all times for the next ten years as proof of our intent. After that period, you may dispose of it in an appropriate manner. Ps: An agent of our office shall be by on Thursday evening to collect the evidence left behind. We ask that you offer him your cooperation. You will be able to recognize him, as he often engages people in conversation and passes himself off as an author of some sort. Um…. I am not Amanita’s mother. But I do know her. She said she would give me the mug for two rupees. What should I do? I accept your terms, and payment will be made, The ransom will be backed by the full faith of the United States Government. However, available currency is restricted to Czech korunas, as the Treasury Department has recently sold the US Federal Debt to the Czechs for a whole bunch of korunas, and a dumpling or two (yum). At current exchange rates, two Indian rupees are worth 0.72 Czech koruna. That means I owe you one koruna, and you owe me 1/2 rupee. I hope that the aforementioned date of Thursday next holds. I talk with myself all the time. I used to give people the old Bert and I joke when they ask why I do it. “I like to speak to an intelligent man, and I like to hear an intelligent man speak.” They chuckle, write me off as a complete loony, and I get to go on my merry way. The fact of the matter is, I use these moments to arrange random thoughts and try to get myself organized. It hasn’t worked out so well, but hope springs internal. As I mouth words to myself, I try to draw ideas out of my subconscious. I know, I am utterly convinced, that the answers to all of peoplekind’s questions are floating around in the vast reaches of my brainpan. That idea doesn’t scare me as it does some others, but it does infuse me with a sense of obligation to the world to come up with answers. I am utterly convinced that my inner intellectual is sitting in there, just waiting to be invited to say a few words on the fate of the world, or the direction to the center of the universe, or how to solve the problems centered around the US national debt. I’ll give you that one for free. Move. Just pack up and move to another country, preferably not Greece, but one perhaps just as pretty but fiscally slightly more conservative. Did I mention that I want to move to Prague? Leave the wasteland that the US will become before too long. Did I mention in the abstract to this article that I am a personal optimist, but a social pessimist? The basic tenet of this philosophy is that the whole world is going to Hell at a rapid pace, but I will survive and thrive amidst the chaos. Good luck, and could I please have another sausage sandwich, prosim? This verbiage is flowing onto the page seemingly at a randomly rapid pace. I do stop now and then to consider my words quite carefully, but it is always possible to overthink things, so I have to be careful lest my motives be misconstrued. There actually is no motive, as you will realize if you refer back to my personal philosophy in the last paragraph. The talking to myself that got me into this train of thought will probably get me an invitation to a bed at the Brattleboro Retreat, which is a lovely place for drug addicted folks and doddering old fools, which is what society calls those who talk to themselves. The biggest attraction of the Retreat as I have heard tell is the petting zoo, which was added to keep the residents calm and compliant. I can see the appeal of spending the day just sitting with a pet bunny in your lap, or staring down a baby pig. The train of thought here seems to be indicating a lack of focus on the task at hand. I’m supposed to be showing the world of writers how brilliant I can be if poked with a sharp prompt. What I seem to have done instead is to put my brain in neutral to coast a bit. The lesson tonight just may be that there are limits to what you can do in any one span of time. The expectations of those around me are going to take a hit if I keep it up, and I will be exposed in all of my human weakness to be just another clothed larval life form waiting and hoping for enlightenment. Welcome to my world. That would have been the perfect closing line for this sitting, but the expectations, both internal and external, revolve around writing for a set amount of time. As that set amount has not yet been reached, I will have to extemporize. Back to the talking man. These days, seeing someone speaking in a slightly raised voice walking down the street or through the local grocery is perfectly normal. We understand Bluetooth. Consider, however, the impact of all these fellow travelers on the poor folks who are speaking without the aid of electronic device, and still feel the need to put voice to the thoughts running through their heads. We walk down the sidewalk talking with someone who may be on the other side of the planet, glance to our right at the guy with his cap in front of him, sitting on the sidewalk, talking away just as we are. We don’t consider that he may be vocalizing the cure for cancer or a path to world peace. The judgment leaps to our thoughts without that intellectual filter that we all seem to lack these days. “I’m talking to someone important here, crazy man, could you please keep it down or take it to another town? Hmm? Please? And, no, I’m not going to give you my hard earned money. If you want some, get a job like I have and you’ll be fine. Now, shoo.” Back to the conversation with the person on the other side of the world. Which of these is the crazy one, and which enlightened? Yield, stop, falling rocks, railroad crossing, all employees must wash hands before returning to work. The car was probably traveling faster than safety would dictate. It had almost made it. 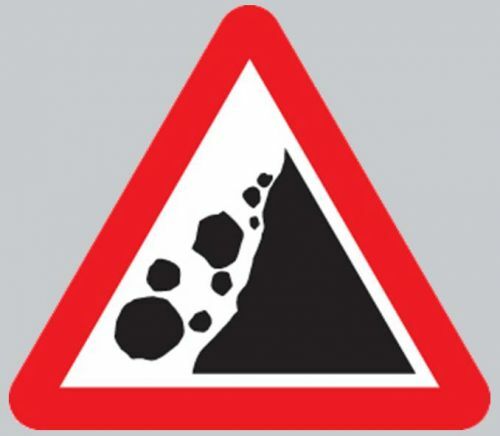 The sign on the mountain road had read “Falling Rocks” and showed a cliff with rocks in mid air. It certainly didn’t show a little car next to the cliff. The ambulance showed up fifteen minutes after the call was received. Why the other cops hadn’t intercepted it, we’ll never know. There was no need for medical attention. The coroner’s office could send someone up to scrape the bodies out of the car after the jaws of life were finished. My partner was still looking a bit green around the gills, but he soldiered on like a trooper. We had finished interviewing the students who found the car and called the incident in. The poor kids were a bit green themselves, and I sent them on their way as soon as I could. Harry, my new partner, was poking around the car still. I walked up beside Harry and looked down at an arsenal. These mooks were carrying more firepower than our entire department had. I hadn’t seen some of these weapons since Viet Nam. Piled on the back seat of the unidentifiable sedan were M-16s, a couple of heavier M-60s, and a crate of claymores. The claymore is one of the best anti-personnel weapons ever invented. It’s a plastic rectangular box with a curved front face with a little note saying “This side toward enemy.” The plastic is filled with explosives and ball bearings. On the floor were ammo crates for the .223 and .30 cal weapons. What the hell had we stepped into here? It seems that these two guys (I think they were guys, from the length of the hairs sticking up out of the mush in the front seats. These days, who knew.) Anyways, it seems these two were on their way to do something very bad when mother nature or fate stepped in and stopped them. “Harry, do me a favor and call this in from the car. We’ll need a CSI team and some higher ups .” Harry headed over to our unit, and I started taking pictures with the camera. I did a complete 360 around the car, and included the mush brothers. Then I did something I thought I’d never do. I reached in and grabbed one of the claymores. I don’t know why. Maybe it’s every boys dream to blow something up with a loud “Boom!” and a hail of ball bearings. I made sure that I got the box with the tripod and igniter grip. I stashed it in my scene bag resting at my feet. Lord help me. I finally got a smart one. I liked this kid. He thought a lot like me.